The park has a lot to offer the visitor in terms of a picnic area with lush green grassy pastures, and , a variety of hiking trails. However, the highlight of any first visit to the park, whether if be for one hour or all day must include a tour of the ranch house. 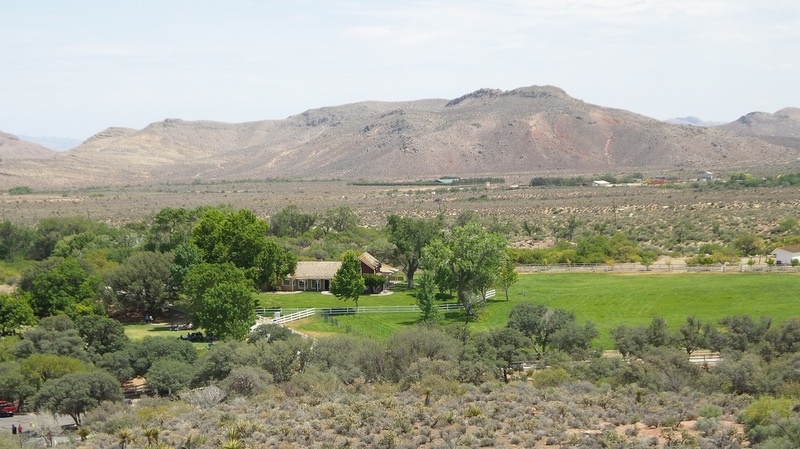 The New England style ranch house sits majestically on a small rise with a commanding view of the ranch and the surrounding sandstone cliffs. Upon leaving the parking lot, one encounters an open pasture with picnic tables on the left, and a one lane gravel road leading up a slight hill to the ranch house. Passing through a gate and going down a narrow walkway, the entry door is reached. Note the different sandstone patterns on the walls of the house, the barn-like garage door, and the bell tower. On passing through the door, one finds a cozy “great room” that extends from one end of the house to the other. 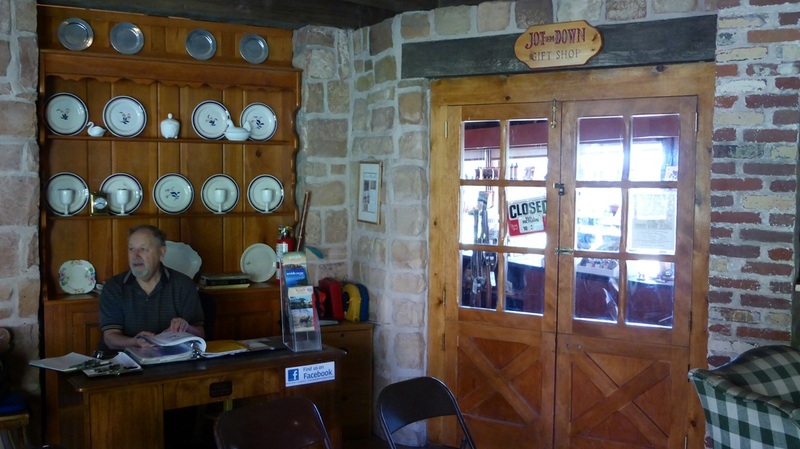 A park docent or volunteer will usually greet you and ask if you have any questions. One’s attention is immediately drawn to the fireplace across the room and the country kitchen to the left at the other end of the room. 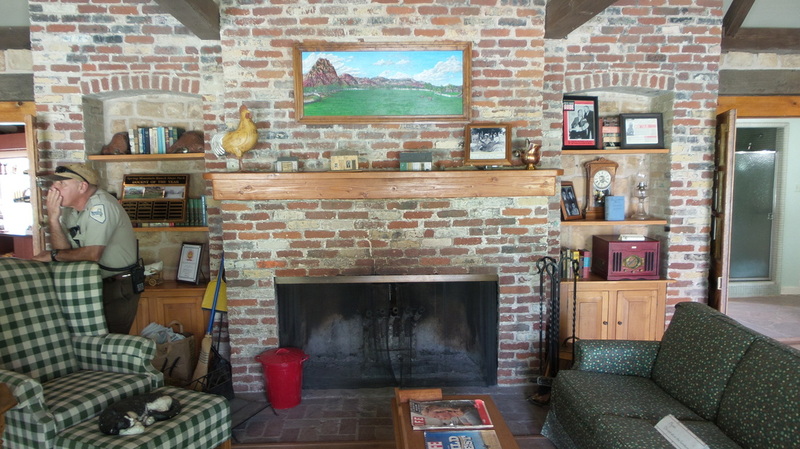 A good way to start exploring the house is to pass through the portal to the right of the kitchen where a 10 minute video of the history of the ranch can be viewed. You are now in the Chet Lauck’s trophy room and Vera Krupp’s kitchen. 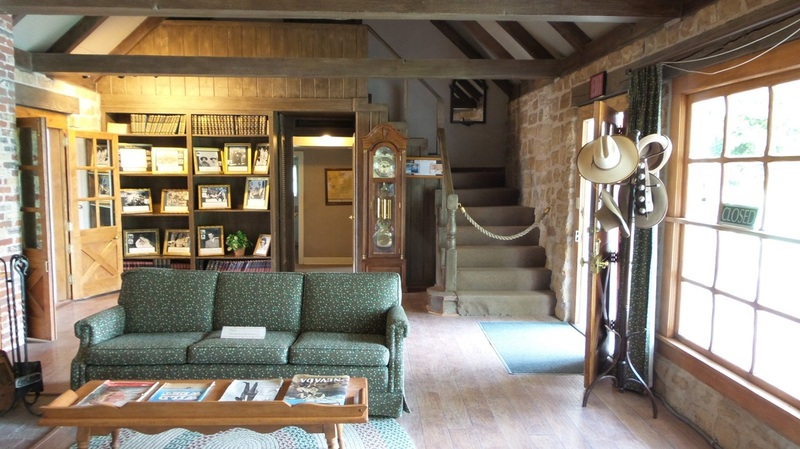 After viewing the video, if more information is desired you are invited to peruse the book on the table behind you that has many historical photos and news clippings about the ranch. 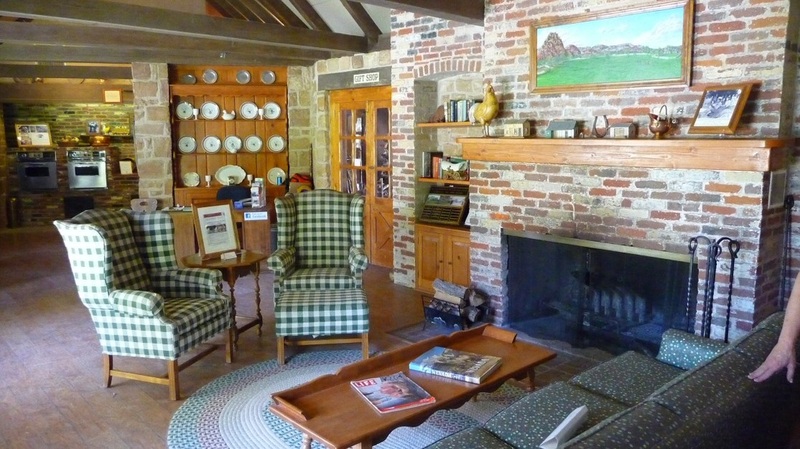 The display cases in the back of this room have pictures and relics of the old ranch life. After leaving the video viewing room, head back to the great room and look at the kitchen area and the associated captioned photos. Note that the appliances an appearance reflect the Howard Hughes era, and differ from those in the Chet Lauck pictures. Next view the kitchen nook on the right, with the table and chairs. The volunteer desk in the corner was a bar in the Howard Hughes days and this bar is now located in another area of the house. 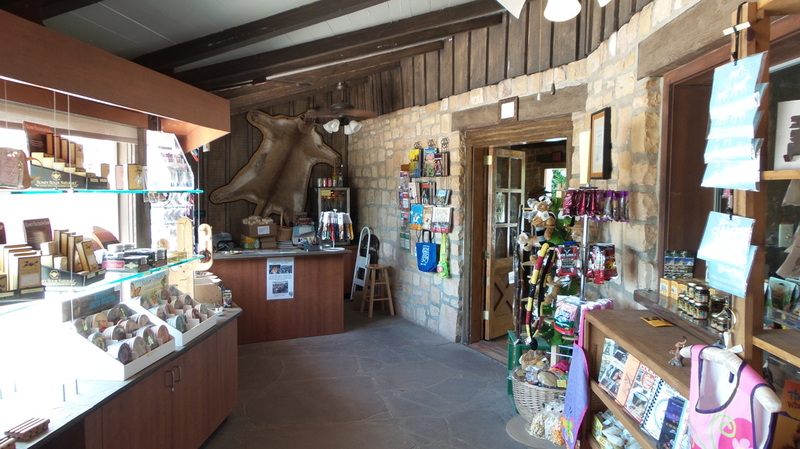 Just past the volunteer desk is the gift shop, which was a screened porch area in the Lauck years and extended the length of this portion of the house. Vera Krupp enclosed the patio and divided it into a dining area and a cabana for those using the pool. What pool you say? Look closely out of the windows and see a desert garden area surrounded by flagstone. The central portion was the pool that Vera built and the Hughes executive also used. For safety reasons and to reduce maintenance costs, the pool was filled with dirt when the park acquired the property. Moving back to the great room note the gun case, fireplace, the wooden beams overhead and the book shelves on the far wall. Here you will find more information and photos on ranch history. Spend some time browsing through this area. Next go into the cabana area that Vera Krupp built. 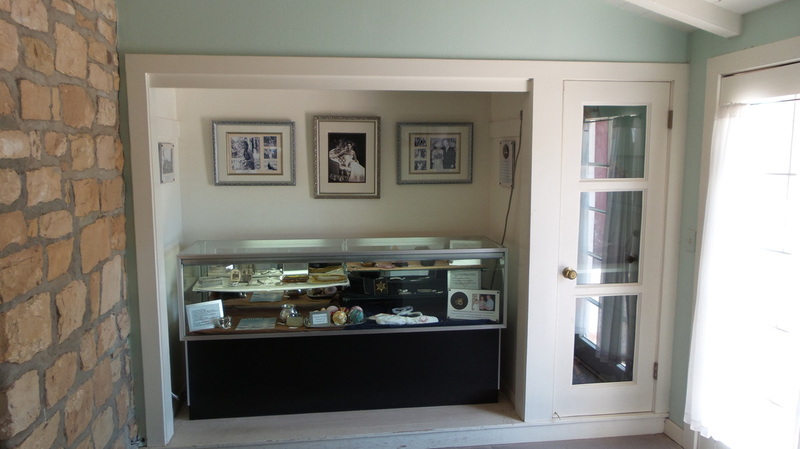 The display case contains some of her personal items and old photos. At this point the self tour is completed. The stairs just past the entrance lead to bedrooms used by the Chester Lauck children and later served as guest rooms. This area and the garage are used by the park service for administration offices and are off limits to the public. If one has the time, and if sufficient staffing is available, ask one of the volunteers about the guided tours of the house and the hiking trails.